I’ve been lucky enough to take a few days off work to travel up to Scotland for a two day symposium on basketmaking at the University of St. Andrews. The symposium is called ‘Woven Communities’ and has a great line up of speakers, on a wide variety of themes. The project seeks to document basket weaving communities in Scotland, both heritage and contemporary, and to create a publicly available compendium of the vast wealth of information that springs from this process. 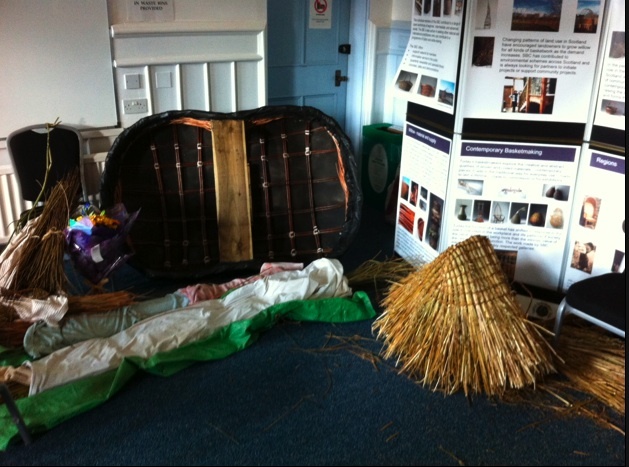 The idea for the project grew out of the Scottish Basketmakers Circle, and has been funded by a research grant from the Arts and Humanities Research Council. 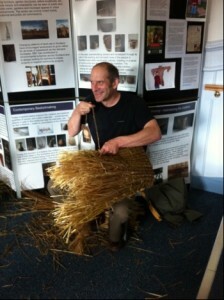 The main theme running through today, the first day, was that of different communities associated with basketmaking. So many interesting things were said, with many connections appearing across the talks but I’ll try to give a whistlestop tour of the day – apologies for the length, it was a packed day! The morning began on the subject of ‘Interwoven communities’ and we all had a go at making a circle out of hair moss, linking them together to form a long ‘interwoven’ chain, followed by an introduction to the project from Stephanie Bunn who’s organising it. 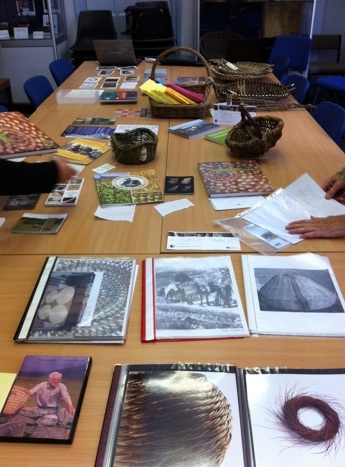 The next session was on the subject of ‘Curating communities’ and looked at various collectors of baskets in Scotland and the role that baskets have played in life in Scotland. There was a talk from Linda Fitzpatrick at the Scottish Fisheries Museum, which introduced us to some of the wide variety of baskets used in the fishing industry and some of their regional variations, such as the line baskets used for laying out the coiled fishing line (up to a mile long and with 1200 hooks in inshore fishing, and up to 15 miles long and with over 5000 hooks in offshore fishing) which come in a range of materials/shapes/heights/depths across Scotland. Ian Tait of the Shetland Museum and Archives showed us that there was more to Shetland basketry than a woman carrying a peat-filled kishie across her back whilst knitting, talking us through some of the materials and uses of baskets in Shetland. A key thing to pick up on was that the basket known as the ‘willow basket’ in Shetland is not actually made from willow, which has historically never been used in Shetland basketmaking – instead they’re cane, which was introduced to the islands in the 1920s. The afternoon session began with us all having a go at making a piece of rope from two pieces of rush. The smell of the rush was incredible – it’s been described to me, but I’ve never experienced it (and spent the rest of the afternoon surreptitiously sniffing my rope). The theme for the first part of the afternoon was ‘Growing communities’. Caroline Dear, an artist and basketmaker from Skye, introduced us to some of the materials available on the island that she’d been experimenting with, including a project in which she made 100 pieces of rope made from different materials over 100 days. 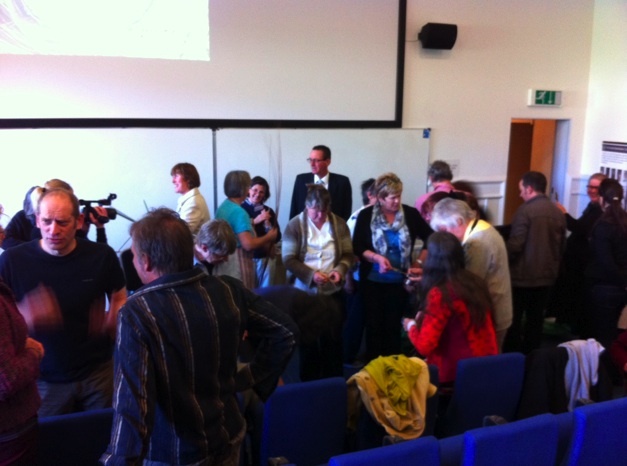 This was followed by two talks from botanists at the Royal Botanic Gardens in Edinburgh. The first, from Greg Kenicer, looked at how little was recorded about plants used in basketmaking by botanists of the Scottish Enlightenment in the eighteenth century, concluding that perhaps baskets were deemed to be so everyday that no mention needed to be made of them. The second, from Ian Edwards, asked us to consider the time involved in basketmaking – in growing the material, preparing the material, and actually making the basket – and included comparisons of similar baskets from around the world, such as woven chestnut baskets in Spain and black ash baskets in North America. The final session of the day asked the question ‘Why make baskets?’, kicking off with a talk by Victoria Mitchell from Norwich University of the Arts which considered how far the concept of basketry can be expanded. Graeme Were from the University of Queensland spoke about his research in Papua New Guinea, concentrating on the ‘arawai’ basket from New Ireland. These baskets were originally made as gardening baskets, then the design/construction changed but the function remained the same, and then the old design was reinstated but they are now used as ‘fashion’ baskets. Most interesting is perhaps the fact that the women who make and wear these baskets don’t see it as a cultural revival, but as something new and contemporary. The day concluded with Lise Bech, a Danish artist and basketmaker from Shetland, giving a personal account of her work. It was a fascinating day, not a dull talk amongst them, and nicely punctuated by good tea-breaks, which always keep you going at these things! It was also great for me to be able to put faces to names I’ve heard so much about over the past couple of years since first getting to know about UK basketry. Look out for tomorrow’s post on Day Two. Day Two of the ‘Woven Communities’ basketry symposium was just as good as Day One. Everyone arrived early to have a go at making bits and bobs and playing with materials, and there was lots of swapping of ideas, techniques and experiences before the presentations got underway. I’d say that there was a more temporal theme to the day, looking at basketry in the past, present and future. The first session, ‘Basketry and the past’, focused on basketry (or the absence of it) in the archaeological record. Willeke Wendrich of UCLA showed us some photos of ancient basketry from Egypt and other parts of the Mediterranean. She made an interesting point about how ‘tradition’ means different things to different people, giving an example of two basketmaking communities in Nubia – one which goes to great lengths to find traditional materials, valuing the material above all, while the other uses modern materials such as chocolate wrappers, valuing the pattern and colour above all. Next up was Hugh Cheape from the University of the Highlands and Islands on the subject of curachs (coracles) and coffins. This was followed by a joint presentation by two conservators, Sherry Doyal and Pieta Greaves, who spoke about the practicalities and problems of conserving the very few waterlogged baskets that are found. While the official title of the next session was ‘National and international woven communities’, it was very much a session about the present. First up was Joe Hogan, a basketmaker and artist from Ireland, who gave a wonderful talk about Irish baskets and his own practice. We often talk about regional variation in baskets, but Joe gave examples of variations between villages often only three or four miles apart. He was followed by Anne Morrell of the Calico Museum of Textiles in Ahmenabad, India, who looked at the relationship between embroidery and basketmaking, and cautioned us against our obsession with naming every stitch, weave, action etc. There was a great quote from Anne ‘Do not assume that things are made using the same methods you know about’. The final talk of this session was from Carlos Fontales, an expert in Spanish basketry, who spoke about the relationship between basketry and pottery in making jugs to hold wine, and introduced us to beautiful woven willow jugs lined with pine resin to make them watertight. The afternoon session began with a mixture of present and future, looking at ideas of sustainability. Mary Butcher spoke about sustainable resources in basketmaking and some of the problems facing supplies of willow (shortage of beds and commercially grown willow), cane (an export ban imposed by the Indonesian government, the largest supplier of cane) and black ash (being destroyed in the millions by the emerald ash borer beetle). Rehema White of the University of St Andrews discussed ideas of sustainable development in relation to basketmaking. Ben Campbell of the University of Durham looked at the effects of nature conservation in Nepal on a bamboo basketmaking culture – when the creation of the Langtang National Park in 1976 banned the trade in forest products and made it necessary to have a licence to cut bamboo. The final session of the symposium was ‘Weaving into the future’. I gave a talk about intangible heritage and heritage craft, and spoke about the work the HCA is doing to ensure that craft skills and knowledge carry on into the future. This was followed by a discussion session led by Emma Walker of CraftScotland, with basketmakers Lois Walpole and Jane Wilkinson, and me, and contributions from the floor. The day ended with Tim Ingold of the University of Aberdeen bringing together the various strands of the symposium, such as tradition, knowledge, materials, politics and a whole lot more. To cap off the day Ewan Balfour, a landscape architect and basketmaker from Shetland, finished the kishie he had been making throughout the conference. On the first day, he could be seen in the front row making what seemed like an endless length of rope, and on the second day he made the basket. That was one of the great things about the conference – the mix of the practical and the academic – and it was great to see people working away with their hands, exploring materials and having an experiment while listening to the talks.